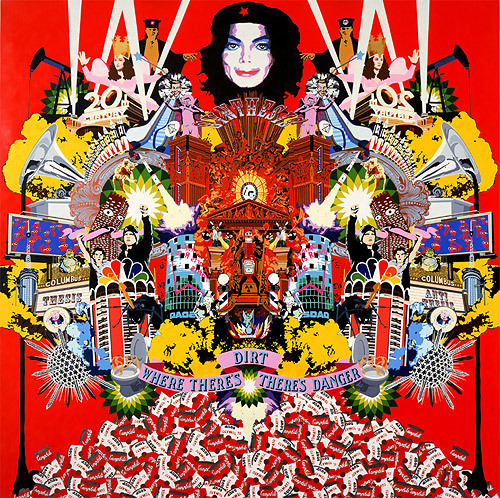 Justin Faunce; “Emperor Tomato Ketchup”; acrylic and glitter on canvas; 72″ x 72″; 2005. This image makes me think of the big cheesy smile I had at the Phoenix show last night at the Wiltern. Everyone was up and dancing and in the middle of one song that band breaks into a MJ riff; worldwide connective tissue. Not only are the Phoenix songs superbly crafted songs, but they have the much needed layered excellence of meaning that any perfect pop masterpiece requires. There was also a moment when I thought, Phoenix would definitely be on a John Hughes soundtrack. Go ahead and touch that universal tender button. Is there any relation between this and the Lane Twitchell paintings you’ve posted before? They seem to have a strikingly similar aesthetic, at least in the explosion of details and symmetrical frame. I should have added — ditto to Autumn’s WOW! I really dug this image. Thanks. It’s funny, I’ve been reading all sorts of remembrances of Jackson that talk about him as a public figure and an icon of popular culture–and that certainly is important–but they virtually sidestep the music. Ultimately, I hope music is what determines his place in history. I’ve been listening to Off The Wall repeatedly over the past couple of days, and it is AMAZING, start to finish. (Some people prefer Thriller, but that’s a Proustian cookie right back to 6th grade, and I’m not ready to go there yet. I am no more capable of evaluating that album than I am my first boyfriend…but anyway.) Yeah. Go listen to Off The Wall, now.